Today is Mothers Day in the United States. Having written so much about my mother in my new book and in this blog over the past few years, I've decided to write about someone else. I never met my paternal grandmother, Marguerite Cobb Wilcox Price, but she has lived legendary in my mind for as long as I can remember. My father always told how much I reminded him of her, that she and I had many of the same physical and emotional traits -- and once he even told a magazine reporter that he thought I was his mother reincarnated. In photos, my grandmother appeared to me to be an overweight bespectacled woman --and I knew her from family stories as chain-smoking battle axe drama queen who had my grandfather wrapped around her little finger. So, to be honest, I was never too comfortable with the connection my dad made between his mom and me. The stories about my grandmother were legendary -- beginning with her appearance in court at age twelve to have her name legally changed from Daisy to Marguerite (French for Daisy) -- because, she pronounced definitively to all in attendance -- "Only cows should be called Daisy." 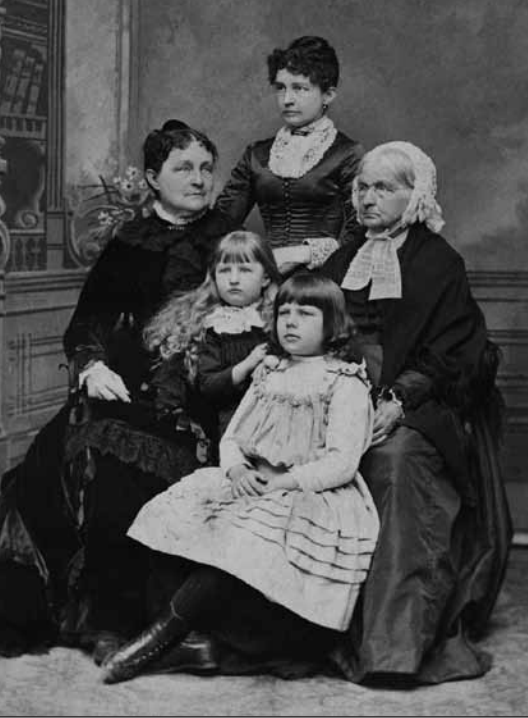 The women of the Cobb-Wilcox family -- my grandmother is in the front. I now know that cows featured heavily in the childhood scenery of young Marguerite, because this past March I visited her childhood home in the heart of America's Dairyland. My grandmother grew up in Mineral Point, Wisconsin, in an ornate architectural specimen at the top of the hill above town in what was then a very important county seat outside Madison, and what is now a beautiful and burgeoning arts community. Walking through the home and the town in which she grew up, I felt like I was trying to find clues about this grandmother I had never met. The beauty of my grandmother's large 19th-century childhood home -- the attention to architectural detail inside and out -- helped me see the high standards and expectation of great things in her future that led my grandmother to choose to marry the wealthy younger son of one of the most successful food manufacturers in the US. I saw how the style to which my grandmother was accustomed guided her every move after she and my grandfather moved to St Louis in 1904. There she continued to exact those same high standards in everything she did -- including the design of the Price family home, now a part of Washington University. My grandmother rocketed out of Mineral Point and into St Louis with stratospherically high social aspirations. She spent years reconstructing her highfaluting family genealogy for acceptance into the Daughters of the American Revolution, and became a prominent fixture in St Louis' social scene. She applied those same high standards to raising and educating all four of her children to become the best that they could possibly be at whatever they did in life. As I visited her childhood home this spring, I suddenly realized how all of those same traits were apparent in both my mother and my stepmother -- two definite, strong, creative, stylish women who designed everything in their own lives (houses, clothes, creative projects) to meet their great expectations of themselves and everyone around them. My stylish and powerful mother Mary Grant Price and stepmother Coral Browne Price. That's when I realized that my dad, like so many men, married his mother. So, how then did my dad see my grandmother in me? Trying to answer that question, I had to try to cop to some of the qualities in myself I like the least -- my exactingly high standards, my interest in appearances, my desire for control. . .Was that what my dad saw of Marguerite in me? I was a strong-willed child, just as his mother had been -- as my own mother and stepmother had been before me. My dad always kept this photo on his desk. It is my stepmother training her childhood dog in Australia. I took my own willful approach to dog wrangling as a child. . . Yes, I think in part it was. . . Yet, it was not just that. In fact, the real clue I got from visiting my grandmother's childhood home was something a little less concrete, a little more metaphysical. When my dad visited Europe for the first time in 1928, he was just seventeen years old. Although overjoyed to be on a great adventure in Europe, he missed his beloved mother so much that he stood on the shores of the Netherlands and tried out something they had both heard about -- telepathic connection. Whether Marguerite heard him telepathically or not, she certainly felt him in her heart. You see, however exacting she may have been toward her children, what I know for sure about this grandmother I never met is that she unreservedly loved her youngest son. You can see it every picture of them. And I have also heard it from everyone who knew her. Marguerite Wilcox Price adored her son. Mother and son shortly before Marguerite's death. According to my brother, Marguerite's death in 1946, when he was 35 years old, devastated our dad. Shortly thereafter, he and my brother's mother went through an incredibly acrimonious divorce. Not long after, my dad married a woman whose high standards and design-based approach to everything matched Marguerite's to a tee. My mother. Who adored him as unreservedly as his own mother had. . . But there was one person who adored him perhaps even more. . .and that person was me. My dad, me, and Snoopy. Just as with mothers and sons, so too is there a unique bond between fathers and daughters. My dad and I had that bond -- and I think more than my strong will, the physical traits my dad thought Marguerite and I shared -- it was the love between parent and child that made my father remember his own mother. It is that same love that lives on in me -- 25 years after my dad's passing -- that has brought me back to my own heart through my daily practice of joy. Visiting Mineral Point, connecting with my grandmother's physical legacy, gave me the chance to think more about the idea of legacy. Although I loved seeing her childhood home, it was what I felt there that has really stayed with me. And what I felt there was love. The love that my grandmother had for her children was passed down to someone who never met her . . . and it lives on in me. That has made me see that, really every day is Mother's Day. Because the love of a mother for their child always lives on in them -- not one a day a year, but every day and in every loving interaction that child has. I may never have met my grandmother, but her legacy of love toward my dad is what allowed him to show up in such pure love for me. That deep love is what allowed me to love him -- and is what modeled loving for me. There are many kinds of legacy. . .but really the only legacy that will ever matter is this legacy of love. So on this Mother's Day, may we all remember to live forward the legacy of mothering -- and show up in as much love as we can to everyone we meet. What better daily practice of joy could there be than living our legacies of love?